For any fish farmer who wants to make more profit, making his/her own fish feed should be an integral part of his venture. This is due to the expensive costs of foreign feeds been used in the country. Even though a farmer decides to use local feeds made by a local feed millers, he/she might be cheated by the feed miller who will reduce the ingredients(or use substandard ones) in order to make more profit. For fast optimal growth of your fishes, you ought to consider the following factors before choosing your own feed formula and ingredients. You should know the nutritional value of various ingredients you wish to use, and with the nutritional requirement of your feed at various stages of growth. These will help you as a farmer to formulate a quality feed. Knowing the nutritional demands of your fishes, or the formula of the feed you want to make will make you prefer some feed ingredients over others. This might is usually connected to cost and availability of such ingredients. When such ingredients are not available, a farmer is saddled with the responsibility of choosing from a wide range of similar ingredients. For instance, when flour or dough is not available, a farmer is faced with the challenge of choosing from energy grains or processed tuber crops to complement the energy requirements of the fish. For instance, due to the high cost of flour in my locality, I used roasted cassava flakes(Garri) to make my own feed. Palatability in this regard refers to the taste preference of the fishes to ingredients. Catfishes have taste preferences. For instance, GNC(Groundnut cake) has better taste and aroma and preferred by catfishes over its substitute Beniseed, and soya meal is preferred above cotton seed too. Cost is very important to choosing the ingredients and formula for your feeds. Low-cost ingredients help keep the cost of production down and give you more profits. However, one should also consider the benefits(profits) of choosing an ingredient despite the cost. You might decide to opt for a local fish meal instead of the costly 72% fish meal to reduce the cost. You can then decide to use other plant sources of protein like Soymeal and GNC. Some ingredients should not be used at all due to the crude processing method which might have led to the loss of essential nutrients. For example,Maize should not be used at all if the available miller cannot effectively mill it to powdery form. This is because fish might not be able to fully digest maize grain that is not well milled. A standard catfish feed must contain some essential nutrients(classes of food) which are required for their optimal growth. This class of nutrient is required for building body tissue and replacement of damaged tissue. It helps in fish growth. It can be obtained from plant and animal sources. 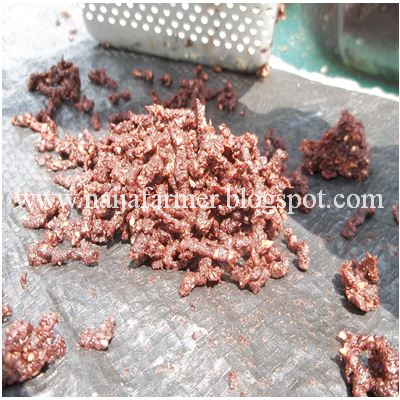 Examples are Groundnut cake and Bloodmeal respectively. Methionine is also protein. This class of nutrients provides the energy needed by catfishes for living. Grains of cereals and tubers like cassava are the major source of this nutrient. ⇒ Read: The art of catfish feeding: How, when, and the right quantity of feeds to give catfish.